The event can be divided into four bits without much difficulty, those being the AGM, the Bars, the Shop and the Music. Late into the night the stage was host to several bands, ranging from a somewhat lonely singer/songwriter though to the semifamous and quite good Kassidy. The building being a great concrete barn of a place, the acoustics left something to be desired, but the bands were quite good and the sound did the best they could in the space, I think. As it filled up, the echoing chasm effect wore off. To some extent the music and sound-checks drove the shop situation worse. For whatever reason – I assume ease of stock-checking – the order-for-later-delivery bulk-beer shop was running orders by taking them down, finding all the stuff, filling and addressing the boxes there and then, and then sending them off for later postage. This meant that every order took ages, and with only five or six people taking the orders on thirty feet of counterspace, queues to place orders went though a joke into epic failure. The two hours it took to actually get my order though are the least fun I’ve ever had whilst at a festival celebrating decent beer. The bars too suffered a little from having vast amount of queuing space to limited serving spots, and could have done with more pumps, but the token system (Since they weren’t licensed for a cash bar, you had to buy tokens worth 1 or 1/2 pint, depending on the beer) sped up the ordering process (because change is annoying and fiddly). It’s hard to complain too much when pints of BrewDog’s as yet unnamed Pale Ale are going for a couple of quid a pint, as are their more famous 5am Saint and Punk IPA brews. So good beer, served at a high quality. Queues got a little silly during some periods, but that’s not really avoidable completely when you have 1500 beer fans and two bars. I missed the actual AGM bit because of queuing for the shop, but the reports I heard were all very positive. The second London Brewdog has a site (in Shoreditch), they hope to start issuing dividends soon, the new brewery provides an 8-fold increase in yield for them, although they’re going to need to spend a few months after it comes up doing quality and consistancy control on beers previously created at the old factory. 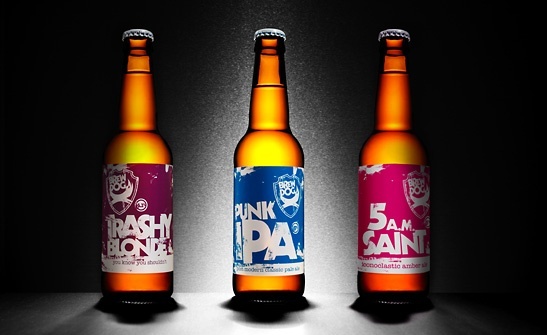 66% of their output goes overseas, they’re looking at international bars, Sweden likes BrewDog. Then on to the aforementioned music and more beer. I managed to track most of what I was drinking on Untappd (Where I am “Aquarion”), and probably need to play with some of the Stone breweries beers, as the ones I’ve tried I’ve liked a lot. Aberdeen is nice enough, though how the exhibition centre managed to get two different Holiday Inns built next to it beggers belief a bit (and nobody warned either of the massive influx for this weekend, something they didn’t cope with perfectly). When I booked the train back, I knew I was going to consider 9:30 the next morning too early, but I can only imagine past-me was attempting to get some kind of vengence. It worked. I am quite tired. I’m waiting for BrewDog to get around to opening in Cambridge. That would be nice and convenient, although I guess I may not be here anymore by then. I expect if I’d been at the AGM the queues would have got to me. Surely they should have had an idea of how many people would be there and hence how stuff would have needed to be run?